Background/aim Diabetes mellitus is one of the most important systemic diseases in the world and considered as the leading cause of endothelial dysfunction. Our previous studies have been clarified the antioxidant, anti-inflammatory, and antidiabetic effects of myrtle extract and fish oil. This study aimed to explore the effect of supplementation of a combination of myrtle extract and fish oil in improving the endothelial dysfunction associated with diabetes. Materials and methods Sixty albino rats were classified into three groups (20 rats each): control group, diabetic group, and treated diabetic group that received myrtle extract and fish oil. Plasma 5-lipoxygenase (5-LOX), interleukin-1β, tumor necrosis factor α, lipoxin-A4, asymmetric dimethylarginine, nitric oxide, glucose, insulin, insulin resistance, and cell membrane fatty acids [arachidonic acid (ω-6), linoleic acid (ω-6), α-linolenic acid (ω-3), and oleic acid (ω-9)] were estimated. Results Using a combination of myrtle extract and fish oil induced significant decrease in the plasma level of 5-lipoxygenase, asymmetric dimethylarginine, arachidonic acid (ω-6), linoleic acid (ω-60), and glucose, whereas induced significant increase in lipoxin-A4, nitric oxide, and α-linolenic acid (ω-3). Conclusion A combination of myrtle extract and fish oil has a potential effect that exceed the beneficial role of each of them in reducing endothelial dysfunction as well as oxidative stress and inflammation associated with diabetes mellitus. Vascular endothelium cells form a cover of thin layer all over the internal surface of blood vessels and have an essential function of hemostasis, vascular tone regulation, and nonsystemic inflammatory action. Recently, it has been proven that malfunctioning endothelium has a great effect on the progress of cardiovascular complications and atherosclerosis in diabetic patients . The development of damaged tissue in diabetic patients occurs mainly owing to inflammation as well as oxidative stress. In insulin-resistant diabetic patients, high proinflammatory cytokines levels have been recorded. Secretion of proinflammatory cytokines such as 5-lipoxygenase (5-LOX), interleukin-1β (1L-1β) and tumor necrosis factor α (TNF-α) is triggered by free radicals, which are induced by hyperglycemia . Nitric oxide (NO) as an antiatherogenic agent has the ability to inhibit the proliferation of the inflammatory operation in atherosclerosis. Reduced bioavailability or synthesis of NO induces dysfunction of endothelial cells, which are considered as an early marker for atherosclerosis in cardiovascular disease . Synthesis of NO via the activity of NO synthase from l-arginine may be inhibited by endogenous l-arginine analogs such as asymmetric dimethylarginine (ADMA), an amino acid present in several kinds of tissue and plasma. Recently, in a wide range of type 1 diabetic patients, ADMA is regarded as an independent risk factor for mortality and cardiovascular diseases . Free fatty acids (FFAs) are considered as risk factors of cardiovascular diseases and are mainly related to the incidents of metabolic syndromes, for example, type 2 diabetes mellitus and obesity . Recently, FFAs are mainly responsible not only for incidence of insulin resistance but also for promoting the inflammatory events in several tissues that are targeted by insulin hormone, such as skeletal muscle, liver, and endothelial cells. So, high levels of FFAs in blood are regarded as an essential linkage between inflammation, type 2 diabetes mellitus, insulin resistance, obesity, and hypertension . Fish oil contains the benefit of long-chain ω-3 polyunsaturated fatty acids (ω-3 PUFAs), for example, docosahexaenoic acid and eicosapentaenoic acid, which are essential for healthy human by minimizing the harmful risk of neurological, brain, gastrointestinal, and cardiovascular diseases and other several states . Medicinal herbs from the mediterranean basin such as myrtle (Myrtus communis L., Myrtaceae) are administrated as a traditional medicine. Fruits and leaves of myrtle have several benefits such as anticancer, antifungal, antibacterial, antiviral, hepatoprotective, neuroprotective, and antidiabetic properties, in addition to anti-inflammatory effects and antioxidant activity  owing to their high content of phenolic compounds . In our previous works, we studied the beneficial effect of myrtle extract treatment against streptozotocin (STZ)-induced experimental diabetes ; moreover, we studied how far fish oil supplementation could affect hyperglycemia through the reduction of arachidonic acid in the cell membrane . So, in this study, we focused on the examination of potential protecting effect and possible benefit of a combination between myrtle extract and fish oil against oxidative stress and inflammation induced by diabetes to confirm our postulation about the additive effect of myrtle extract and fish oil supplementation. All drugs and chemicals for ex-vivo experiments were purchased from Sigma-Aldrich (St Louis, Missouri, USA) and Biomedicals LLC (France). STZ and all other used chemicals were purchased from Sigma-Aldrich. Fatty acids standards [high-performance liquid chromatography (HPLC) grade] were purchased from Sigma-Aldrich. Myrtus leaves were collected from Faculty of Agriculture, Fayoum University, Egypt. Refined fish oil was purchased from a local pharmacy in Cairo, Egypt. The collected samples were air dried and grinded into a powdered form; a known weight of air-dried powdered leaves was extracted at room temperature (28±2°C) with successive chloroform and methanol treatment. This extraction process was repeated at least five times until each organic solvent became colorless. The obtained extracts were filtered over Whatman no. 1 filter paper, and the combined extract (filtrate) was evaporated to dryness by vacuum rotary evaporator at 45°C. The dried chloroform and methanol extracts (residues) were stored in desiccators at 4°C until use . Sixty albino rats (weighing 180–200 g) at the beginning of the experiment were obtained from the animal house of the National Research Centre and were used in this study. The rats were individually housed in clean polypropylene cages and maintained in a controlled temperature room (22±2°C) under a 12 h light and a 12 h dark cycle, with free access to water and standard rat food pellets. Animals were allowed 14 days to acclimatize to the laboratory conditions before the experiment. All procedures were conducted in accordance with ethical guidelines and approved by the Ethical Committee of National Research Centre. Sixty albino rats were divided into three groups, with 20 rats in each group, and were classified as follows: group I was the control group, group II was the diabetic group, and group III was the myrtle and fish oil-treated diabetic group, which received myrtle extract daily orally in dose of 100 mg/kg body weight  and fish oil in a dose of 1.2 ml/kg body weight/day orally  during the experimental period (8 weeks). Diabetes was induced by intraperitoneal injection of freshly prepared STZ (40 mg/kg of body weight) dissolved in 0.1 mol/l sodium citrate buffer (pH 4.5) according to the method of Hussein et al. . The animals were allowed to drink 5% glucose solution over night to prevent initial STZ-induced hypoglycemic mortality. Forty-eight hours after last STZ dose, fasting blood glucose levels were monitored and animals with glucose levels more than 200 mg/dl were considered diabetic and assigned for different treatment regimens. After the experimental period, animals were kept fasting for 12 h before blood sampling. Blood was withdrawn from the retro-orbital venous plexus of the eye using capillary tubes and collected in (a) tubes contain sodium fluoride for blood glucose estimation and (b) heparinized tubes for other biochemical parameters. Blood was centrifuged at 3000 rpm for 10 min using cooling centrifuge. Plasma was separated and immediately frozen. Packed red blood cells were used for isolation and extraction of erythrocyte membrane lipids. Fasting blood glucose was determined immediately using enzymatic colorimetric method, using kits of Centronic Co. (Wartenberg, Germany), according to method of Trinder . Plasma insulin level was estimated by enzyme-linked immune sorbent assay according to Yallow and Bawman  using BioSoure INS-EASIA Co. (Nivelles, Belgium) Kit. Insulin resistance was calculated from the following equation: Insulin resistance=fasting glucose (mg/dl)×fasting insulin (μIU/ml)/405, according to Mathews et al. .
TNF-α, 5-LOX, IL-1β, lipoxin-A4 (LA-4), and ADMA were determined according to Ferreira et al. , Hardya et al. , Vallejo et al. , Dobrian et al. , and Deanfield et al. , respectively, by using enzyme-linked immune sorbent assay for rat according to the manufacturer’s protocols (R&D Systems, UK). NO measured as nitrite was determined by using Griess reagent, according to the method of Moshage et al. where nitrite, stable end product of NO radical, is mostly used as indicator for the production of NO. Analysis of cell membrane fatty acids was done by HPLC. Cell membrane was homogenized in 2% acetic acid-ethyl ether mixture (2 : 1 volume ratio). The solution was then filtered and centrifuged at 500g. The organic phase was evaporated to dryness. The extract was dissolved in 200 μl acetonitrile . Fish oil samples (three different samples from different places) were extracted using 2% acetic acid-ethyl ether mixture. This method was carried out after modification of the method described previously by Aveldano et al. HPLC column C18 (260×4.6, particle size 5 μl) was used as the stationary phase, and the mobile phase was acetonitrile/water mixture (70/30) v/v by isocratic elution, with flow rate of 1 ml/min and 200 nm wavelength. Serial dilutions of standards were injected, and their peak areas were determined. A linear standard curve was constructed by plotting peak areas versus the corresponding concentrations. The concentration of samples was obtained from the standard curve. All data were expressed as mean±SE. Distribution of the data was verified to be normal using tests of normality (SPSS package, version 8, USA). Statistical significance will be tested by one-way analysis of variance followed by Bonferroni’s post-hoc analysis. P value less than 0.05 was considered statistically significant. [Table 1] showed significant increase in glucose and insulin resistance with significant decrease in insulin level in the diabetic group as compared with the control; these results improved after treatment with a mixture of myrtle and fish oil. 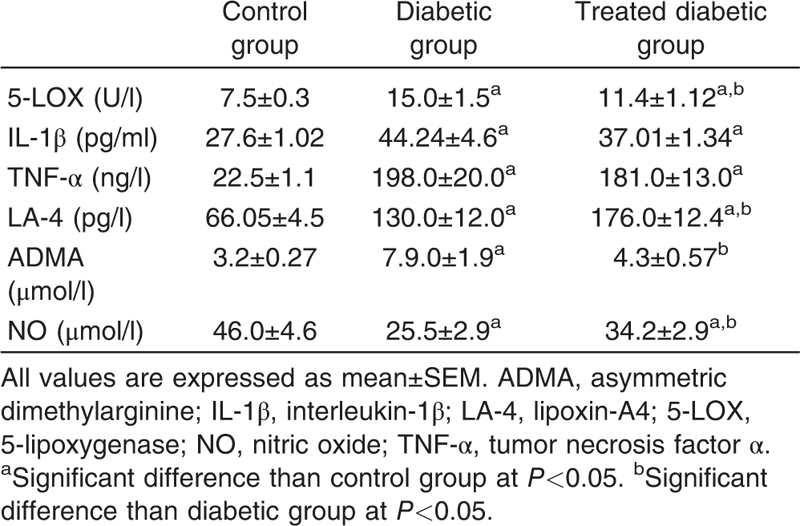 [Table 2] recorded significant increase in 5-LOX, 1L-β, TNF-α, LA-4, and ADMA in the diabetic group as compared with the control; these results improved after treatment with a cocktail of myrtle and fish oil. NO showed significant decrease in the diabetic group, and it significantly increased after treatment. [Table 3] showed significant increase in AA, LA, and OA and a significant decrease in ALA in the diabetic group compared with the control group; the treatment improved these levels. The vascular damage that occurs in major diseases such as atherosclerosis, hypertension, diabetes, and aging is caused by endothelial dysfunction, which represents, from the biological and clinical points of view, an enormous challenge . 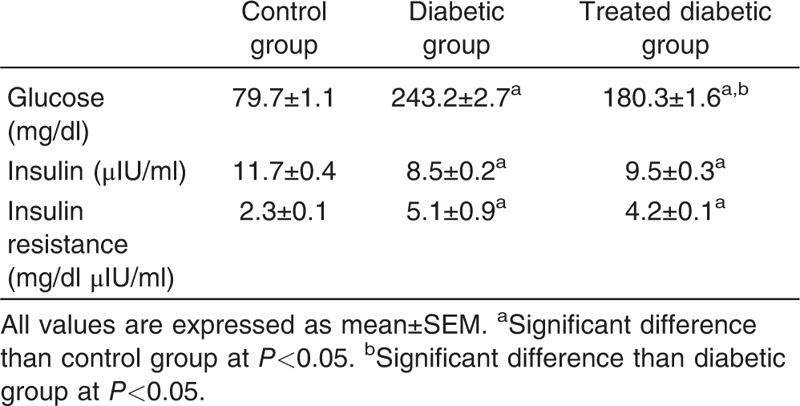 In the present study, it was found that the diabetic group showed significant increase in glucose and insulin resistance and significant decrease in insulin compared with the control group ([Table 1]). These results were in agreement with Krishna et al. who stated that the destruction of the β-islet cells of the pancreas by STZ is the causative factor for the increase in the level of blood glucose and the decrease in the level of insulin in the serum of the diabetic group (the β-cells being responsible for the normal homeostasis of blood glucose by secreting insulin hormone). Wadood et al. suggested that glucose was absorbed and used by cells through glycolysis, pentose-phosphate pathway, Kreb’s cycle, and glycogenesis, by help of insulin. When diabetes is induced by STZ, the β-cells lose their ability to produce insulin leading to accumulation of excess glucose in the blood and failure of glucose utilization and storage. The reduction of insulin level and elevation of blood glucose in diabetic group in this study confirmed this suggestion. Supplementation of myrtle extract helps to protect the β-cells of the pancreas from being damaged by the free radicals produced in diabetics and thus insulin level increases and insulin resistance decreases leading to reduced blood glucose level . This study showed that 5-LOX, IL-1β, TNF-α, and LA-4 levels were significantly high in the diabetic group compared with the control group, but these levels were improved after treatment with myrtle extract and fish oil ([Table 2]). This coincides with what Rossi et al. stated about the ability of myrtle extract to inhibit TNF-α, neutrophil infiltration, formation of reactive oxygen species, elastase release, and eicosanoids biosynthesis [through inhibition of cyclooxygenase (COX)-1 and 5-LOX in vitro and blockage of receptor coupled Ca2+ mobilization in vivo]; all of which contribute to the initiation and maintenance of the inflammatory process. Previous studies stated that hyperglycemia leads to decrease in antioxidant capacity whereas increase in pro-oxidative and proinflammatory cytokines secretion. These factors contribute to diabetic complications. Proinflammatory cytokines are categorized as markers of inflammation of blood vessels. Increased levels of IL-1, IL-6, TNF-α, and other inflammatory cytokines were found in different insulin-resistant and diabetic states . Hussine et al. suggested that increased oxidative stress may suppress the activation of insulin receptor and reduce the translocation of glucose transporter (GLUT)-4 of the cell membrane. Antioxidants increase glucose disposal through the translocation of GLUT-4 on the cell membrane and increase uptake of basal glucose via redistribution of GLUT-1. Our study showed that a combination of myrtle extract and fish oil supplementation has the ability to reduce ADMA level and elevate NO level significantly, as NO may be inhibited by endogenous l-arginine analogs such as ADMA ([Table 2]). The plasma and endothelial cells of STZ-induced diabetic rats showed increased ADMA concentrations compared with those of nondiabetic rats. Many studies suggest that the reduced expression of dimethylarginine dimethylaminohydrolase enzyme, which leads to degradation of ADMA, caused elevation of endothelial ADMA concentration ,. The current study showed significant increase in AA, LA, and OA and a significant decrease in ALA in diabetic group compared with control; our study proved that myrtle extract and fish oil supplementation significantly decreased AA and LA and significantly increased ALA in treated diabetic group compared with diabetic one, whereas the mean value of OA was insignificantly changed in the two groups ([Table 3]). There are two metabolic pathways of AA, which are the LOX and the COX pathways. AA is converted by COX to prostaglandins, thromboxanes, and prostacyclins and is converted by LOX to leukotrienes or hydroxyeicosatetraenioc acids . It was also stated that ω-3 PUFAs have the ability to cause displacement of arachidonic acid in cell membranes. They can compete for COX and LOX enzymes producing eicosanoids such as prostaglandins, thromboxanes, and leukotrienes, leading to the formation of products having structures that are different from those derived from arachidonic acid . Fish oil is recommended as a source of n-3 PUFA, particularly eicosapentaenoic acid (20 : 5, n-3) and docosahexaenoic acid (22 : 6, n-3). The n-3 PUFA are precursors of prostaglandins, thromboxanes, and leukotrienes . The present study demonstrated that a combination of myrtle extract and fish oil has the ability to restore endothelial dysfunction in STZ-induced diabetic rats owing to the additive effect of the two treatment agents that gave this cocktail a powerful effect, including antioxidant, anti-inflammatory, and antihyperglycemic properties. More clinical studies are needed to confirm our finding. The authors are grateful to the National Research Centre – Cairo, Egypt for funding project no. 10010310 and providing space to carry out this work. Wils J, Favre J, Bellien J. Modulating putative endothelial progenitor cells for the treatment of endothelial dysfunction and cardiovascular complications in diabetes. Pharmacol Ther 2017; 170:98–115. Laubertová L, Koňariková K, Gbelcová H, Ďuračková Z, Muchová J, Garaiova I et al. Fish oil emulsion supplementation might improve quality of life of diabetic patients due to its antioxidant and anti-inflammatory properties. Nutr Res 2017; 46:49–58. Yokoro M, Nakayama Y, Yamagishi SI, Ando R, Sugiyama M, Ito S et al. Asymmetric dimethylarginine contributes to the impaired response to erythropoietin in CKD-anemia. J Am Soc Nephrol 2017; 28:2670–2680. Osorio-Yáñez C, Chin-Chan M, Sánchez-Peña LC, Atzatzi-Aguilar OG, Olivares-Reyes JA, Segovia J et al. The ADMA/DDAH/NO pathway in humanvein endothelial cells exposed to arsenite. Toxicol in Vitro 2017; 42:281–286. Boden G. Obesity and free fatty acids. Endocrinol Metab Clin North Am 2008; 37:635–646. Ghosh A, Gao L, Thakur A, Siu PM, Lai CWK. Role of free fatty acids in endothelialdysfunction. J Biomed Sci 2017; 24:50. Khedr N. Fish oil and wheat germ oil supplementation modulates brain injury in streptozotocin-induced diabetic rats. J Diabetes. 2017; 9:1012–1022. Safari R, Hoseinifar SH, van Doan H, Dadar M. The effects of dietary myrtle (Myrtus communis) on skin mucus immune parameters and mRNA levels of growth, antioxidant and immune related genes in zebrafish (Danior erio). Fish Shellfish Immunol 2017; 66:264–269. Rasheed WI, Ashour MN, Elias TR, Agaibyi MH, Farrag A, Diab Y et al. Effects of antioxidant enzyme activities of myrtle extract on endothelial dysfunction in normoglycemic and diabetic rats. J Chem Pharm Res 2016; 8:889–895. El-Bana MA, Medhat D, Ashour MN, Diab Y, Hussein JS. Myrtus communis extract attenuates atherosclerosis in streptozotocin-induced diabetic rats. Biosci Res 2016; 14:257–264. Hussein J, El-Khayat Z, Taha M, Morsy S, Oraby F, Singer G. The effect of fish oil on oxidant/antioxidant status in diabetic rats through the reduction of arachidonic acid in the cell membrane. Int J Pharm Pharm Sci 2014; 6:196–199. Messaoud C, Laabidi A, Boussaid M. Myrtus communis L. infusions: the effect of in fusion time on phytochemical composition, antioxidant, and antimicrobial activities. J Food Sci 2012; 77:941–947. Hussein J, El-khayat Z, Taha M, Morsy S, Drees E, Khateeb S. Dietary omega-3 fatty acids prevent erythrocyte membrane atpase reduction in streptozotocin induced diabetic rats. Int J Pharm Pharm Sci 2013; 5:211–216. Trinder P. Determination of glucose in blood using glucose oxidase with an alternative oxygen acceptor. Ann Clin Biochem 1969; 6:24–27. Yalow R, Bauman WA. Plasma insulin in health and disease. In: Ellenberg M, Rifkin H, editors. Diabetes mellitus; 1983. pp. 119–150. Mathews DR, Hoker JP, Rudenski AS, Naylor BA, Treacher DF, Turner RC. Homeostasis model assessment: insulin resistance and β-cell function from fasting plasma glucose and insulin concentrations in man. Diabetologia 1985; 28:412–419. Ferreira L, Teixeira-de-Lemos E, Pinto F, Parada B, Mega C, Vala H et al. Effects of sitagliptin treatment on dysmetabolism, inflammation, and oxidative stress in an animal model of type 2 diabetes (ZDF rat). Mediators Inflamm 2010; 2010:592760. Hardya G, Vergnaudb S, Lunardic J, Peoc’h M, Bessarda G, Stanke-Labesquea F. 5-Lipoxygenase expression and activity in aorta from streptozotocin-induceddiabetic rats. Prostaglandins Other Lipid Mediat 2005; 75:91–103. Vallejo S, Palacios E, Romacho T, Villalobos L, Peiró C, Sánchez-Ferrer CF. The interleukin-1 receptor antagonist anakinra improves endothelial dysfunction in streptozotocin-induced diabetic rats. Cardiovasc Diabetol 2014; 13:158. Dobrian AD, Lieb DC, Cole BK, Taylor-Fishwick DA, Chakrabarti SK, Nadler JL. Functional and pathological roles of the 12- and 15-lipoxygenases. Prog Lipid Res 2011; 50:115–131. Deanfield JE, Halcox JP, Rabelink TJ. Endothelial function and dysfunction: testing and clinical relevance. Circulation 2007; 115:1285–1295. Moshage H, Kok B, Huizenga JR. Nitrite and nitrate determination in plasma: a criticalevaluation. Clin Chem 1995; 41: 892–896. Hussein JS, Ashour MN, Rasheed WI, Medhat D, El-Bana MA, Morsy SM et al. Marine n-3 fatty acids attenuate pro-inflammatory mediators in ovariectomized rats as a model of postmenopausal. Der Pharmacia Lettre 2016; 8:250–254. Aveldano M, van Rollins M, Horrocks L. Separation and quantitation of free fatty acids and fatty acid methyl esters by reverse phase high pressure liquid chromatography. J Lipid Res 1983; 24:83–93. Berezin AE. Endothelial progenitor cells dysfunction and impaired tissue reparation: the missed link in diabetes mellitus development. Diabetes Metab Syndr 2017; 11:215–220. Krishna D, Rao S, Satyanarayana ML. Serum insulin levels and lipid profiles of streptozotocin induced diabetic wistar rats. J Indian Vet Assoc 2012; 10:22–26. Wadood N, Nisar M, Rashid A, Wadood A, Nawab G, Khan A. Effect of a compound recipe (medicinal plants) on serum insulin levels of alloxan induced diabetic rabbits. J Ayub Med Coll Abbottabad 2007; 19:32–38. Rossi A, di Paola R, Mazzon E, Genovese T, Caminiti R, Bramanti P et al. Myrtucommulone from Myrtus communis exhibits potent anti-inflammatory effectiveness in vivo. J Pharmacol Exp Ther 2009; 329:76–86. Hussein J, El-Khayat Z, Taha M, Morsy S, Drees E, Khateeb S. Insulin resistance and oxidative stress in diabetic rats treated with flaxseed oil. J Med Plants Res 2012; 6:5499–5506. Mahfouz MH, Emara IA, Shouman MS, Ezz MK. Asymmetrical dimethylarginine (ADMA) and nitric oxide as potential cardiovascular risk factors in type 2 diabetes mellitus. Afr J Biochem Res 2009; 3:293–301. Lin KY, Ito A, Asagami T, Tsao PS, Adimoolam S, Kimoto M et al. Impaired nitric oxide synthase pathway in diabetes mellitus: role of asymmetric dimethylarginine and dimethylarginine dimethylaminohydrolase. Circulation 2002; 106:987–992.